For the fashionista who can't travel light, this haul-it-all design from Style&co. is the perfect choice. Fashioned in soft faux leather with a generous interior, gilded signature hardware finishes the look. Approx Width 15 in Approx Height without handles: 11 in. Canvas with faux leather trim. 11"W x 11-1/2"H x 6"D. 10"L double handles. Collection: Josei. Style Type : Tote Bag. Fabric Type : Faux leather ; Fabric lining. Manufacturer: Style&Co. 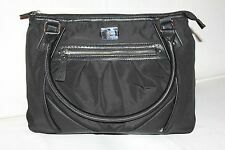 Exterior features silver-tone hardware, 1 front zip pocket. Handle Type : Double Handle. Manufacturer Color: Black. NWT Style & Co. Style & Co. Computers & Networking. Clothing & Accessories. We Cover It! "Clean Cut" Reversible Tote, Brown/Maroon, Detachable Wristlet, NWT. 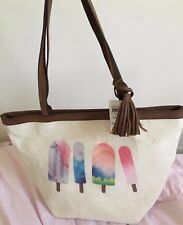 Style Co Clean Cut Reversible Tote with Free Wristlet, Brown Maroon, NWT! Includes removable zip organizer pouch. Make Supersized Seem Small. 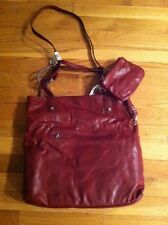 STYLE & CO TWISTLOCK Berry Maroon Faux Leather Tote Bag. COLOR: BERRY / MAROON. Berry Lining Interior. Signature leather patch. Long adjustable strap 10" drop. Rear zip pocket. Top zipper Closure. 1 Front zip pocket. Color Brown. Dustbag Not Included. Care Card Not Included. Hardware Color Silver-toned. Clean Cut Reversible Tote With Wristlet. Blue Wristlet 6.5" L x 4" H.
Handles with 7" drop, that lie flat when used as flap crossbody. CONVERTIBLE LARGE TOTE. Top hidden snap closure. Exterior large zip pocket. Interior zip pocket with trim. Two multi-function slip pockets. 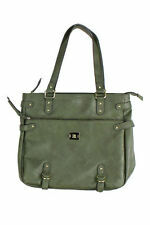 Style & Co. New Green Precious Cargo Tote-Dark Green- MSRP: $88.00. Shoulder Beige Handbag. Magnetic Closure. Color Purple. Hardware Color Silver-toned. Condition The item in the picture is the one you will receive. (SEE THE PICTURES.). Color : Milky White. - Gold tone hardware. Defect : Scuff marks/Stain on back of bag (bottom center and right). Pink stains on back of bag ( top and bottom right). - Double top handles with 9 1/2 ” drop. Style & Co. Twistlock Tote (Blue). Feel free to ask more for more photos. Magnetic snap tab closure. 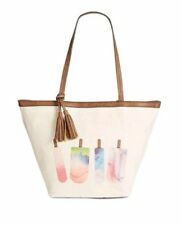 Style & Co. From fun to fabulous, Style & Co. has a printed canvas tote to suit your personality (and plans). • Canvas; trim: faux leather. • Silhouette is based off 5'9" model. Feel free to ask for more pics & info. 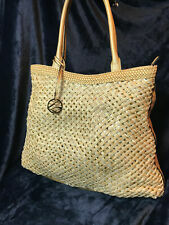 Large Style & Co zippered purse/tote in faux gold pebbled leather with a layer of sequins with woven lattice design over top. 100% Authentic STYLE & CO SLOUCHY Pewter Leather Hobo Shoulder Bag. Made of Pewter Faux Leather. COLOR: PEWTER. Black Faux leather trim. 1 zip pocket. We are not responsible for any extra fees they set. 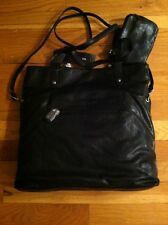 100% Authentic STYLE & CO Slouchy black Leather Hobo Bag. The handbag is in great conditions besides this defect. Made of faux Black Leather. Light brown Faux leather trim. 1 zip pocket. Single strap with 18" drop. Clean Cut Reversible Tote With Wristlet. Blue Wristlet 6.5" L x 4" H. Pearl Blue & Grey Magnetic Closure. AUTUMN OXBLOOD RED FAUX LEATHER. Detachable wristlet. Detachable Shoulder Strap 18" drop. Interior zip pocket and two open pockets. 15" W x 14" H x 4-1/2" D.
Detachable wristlet. Detachable Shoulder Strap 18" drop. Interior zip pocket and two open pockets. Double handles with 9" drop. Style & Co. FREE Trial!